Audience watching “Shakh” polish off Fabiano Caruana. Shakhriyar Mamedyarov is certainly a hometown favorite in this tournament. 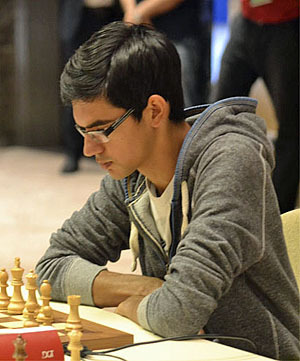 As the only Azeri remaining in the competition, he was motivated against American Fabiano Caruana. “Shakh” proceeded to create a sensation with a scintillating victory after a brutal kingside mating attack. After Caruana resigned, the crowd in the viewing let out roar and excited Azeris came and whisked him off to an excited press conference. This may have been a proud moment given the pressure of playing in front of fans as a national hero. Meanwhile, Caruana falls behind, yet knowing that he has already qualified for the Candidates, pressure will not be great. Mamedyarov sent Caruana home with a scintillating attack beginning with 28.Nh5! 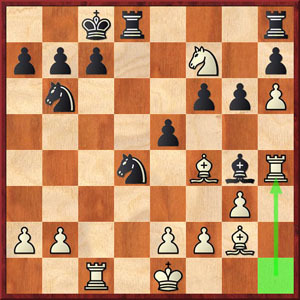 In Mamedyarov-Caruana, white tried a pseudo-Trompowsky Attack creating a weird structure. 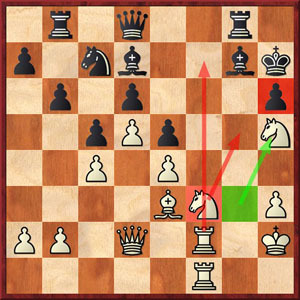 Caruana’s kingside was already weakened before he played 13…Nh5!? Those who remember when Bobby Fischer played this against Boris Spassky in a Modern Benoni will recall the horror the spectators felt after realizing that Bxh5 would shred the kingside. However, more is known about this plan today and black has been able to get good compensation including that brilliant Fischer win. After 13…Nh5, white did follow with 14.Bg5 Qd8?! 15.Bxh5! The difference here is black does not have f7-pawn which normally protect e6 and g6 squares. Caruana tried to close the position with 20…e5, but it didn’t help. Shakh was able to probe the light squares after 26.g3! hxg3+ 27.Nxg3 Rg8 28.Nh5! (diagram above). The attack was swift, but with no less pain for Caruana whose was probably saying a prayer for his king. Too late. Death was imminent. All of white’s pieces were barreling down the kingside while the black army could do nothing but watch the white pieces encircle the black king. The white queen slid up with 39.Qh5 and delivered the coup de grace. 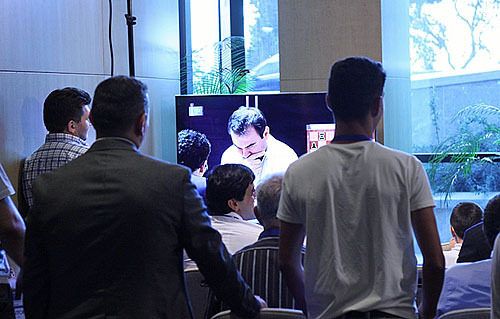 Thunderous applause could be heard in the viewing room and Shakh was whisked away from the playing room. Does 17…h5 work in this hedgehog structure? 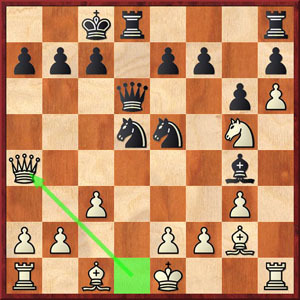 Maybe the “Fischer Attack” with Kh8, Bc7, Rg8, g5 idea was better. Another interesting game was Svidler-Topalov and Sicilian Rossolimo that turned into a type of Maroczy Bind. Topalov assumed the flexible and solid hedgehog setup which is incredibly hard to squash and black has all types of ideas centering around dangerous pawn breaks. However, Topalov played 17…h5?! which can’t be that good in this position. The idea is …h4-h3 softening up the a8-h1 diagonal. This idea fizzled and white soon won that pawn. The game carried on with each side nursing passed pawns with two rooks and a queen guarding their advance. 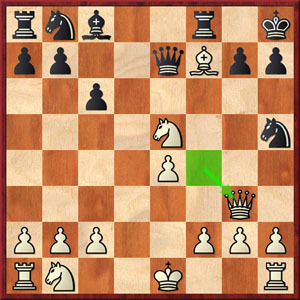 In a complicated finale, white was able to blast open the kingside after 55. h5! Svidler stated that he was surprised Topalov took the pawns so fast. Sure enough… black’s king was soon being assailed from all sides. 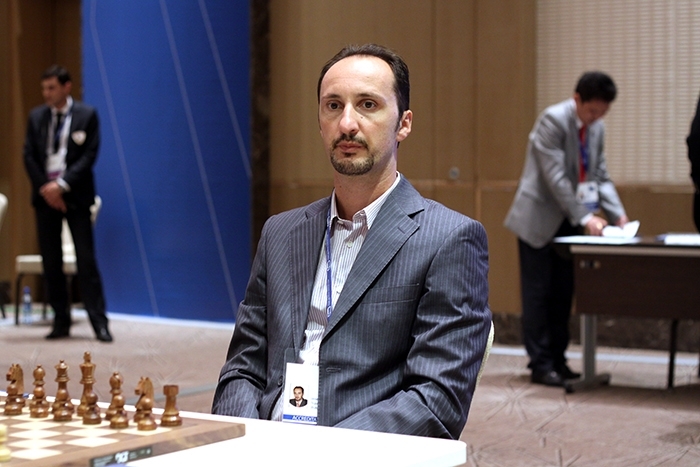 In an unlikely ending Topalov allowed mate on the board. Instructive lesson in Topalov’s hedgehog, but quills not sharp enough against Russian bear. Photos by Eteri Kublashvili (for FIDE). Ding-Wei was absolutely crazy… a theoretical, tactical anti-Grunfeld that was difficult to evaluate. In the post-mortem, Ding gave an impressive display of analysis showing lines at dizzying speed. The complexity of the game was mind-blowing! It would remind one of computer chess. Word is that Chinese are incredibly tactical and if you can understand the positions below you’ll get an idea of how complicated the game was. In Ding Liren-Wei Yi, positions after 12.Qa4!? and 18.Rh4! 18.Rh4! was another computer-like move which saved the initiative white. Both sides were walking a tightrope in the position and after the stunning 29.Nd6+!! cxd6 30.Rxh7 white has created a dangerous h-pawn that would decide the game. Powerful game by the Chinese #1! Below is the post-mortem. Get your aspirin ready! 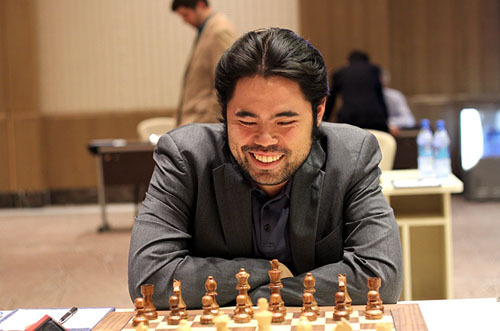 Hikaru Nakamura bolted ahead of Michael Adams 1-0 after the American powered to victory. Something went wrong in the opening for Adams as Nakamura seized tremendous initiative. In the double rook ending, black’s pawns were scattered and king unsafe as white hit at every target with reckless abandon. After winning material, Nakamura pushed his pawn majority through on the kingside and wrapped up the win. 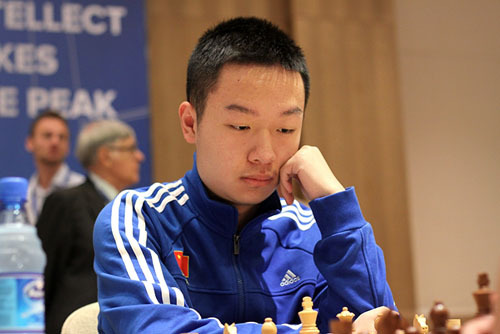 Topalov, Caruana, So and Adams sent home… Wei Yi equalizes! Wei Yi wins a clutch battle… Chinese derby will go to tiebreaks tomorrow. When interviewed after his win, Ding Liren was asked if it was uncomfortable playing against his compatriot. He stated that he did not feel pressure because there would be a Chinese moving to the next round. Interesting collectivist mentality. Well… Wei Yi is trying to be the Chinese to move on after he saved the match with an improbably win today. It appeared as if Ding Liren would slip away, but missed a chance at a computer-like draw. Wei Yi equalized and the match will go to rapid tiebreaks. Wei played the sharp 67.Rb3! which looks to be winning, but there is no way to win black’s rook after 67…Rxb3 68.d8(Q)+. Ding later missed his chance to hold and the young prodigy leveled the match score. In their Ruy Lopez encounter, it was another sharp battle that unwound in the middle game. White was up a pawn, but black was attempting a blockade. Just as white was making progress, Ding sacrifice another pawn with 54…h4! to devalue white’s king safety and get the queens off the board. After 55.gxh4 Qe5+ 56.Qg3+ Qxg3 57.Kxg3 Rxe4 black would be able to complicate things and fight to draw, but white played 55.Kh3? and gave black a path to clinch the match with a draw. However, rook endings being so complicated, Ding Liren erred with 61.Rc8? and the white king was no longer cut off. Fascinating play developed and Ding Liren missed a chance to hold on 72…Kf3 and clinch the match. He played 72…Kh4?? and the queen was eventually able to skewer the rook. It will be a tough match tomorrow, but guarantees that one Chinese will advance. Wesley So has been having uneven results in the past several months. After an abysmal debut at the U.S. Championship, he rebounded with a strong outing at the Shakmir Memorial. At the World Cup he was having another solid result, but against Maxime Vachier-Lagrave got lost in the complications. So erred with 22.Bxd5? and fell into hot water after 22…Ne5! 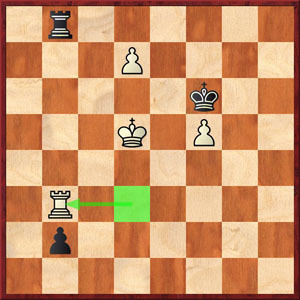 White was faced with losing a piece, so he sacrificed a bishop for a couple of pawns. However, MVL forced a trade of rooks and it was a knight versus two pawns. So set a couple of traps for MVL, but in the end white simply would run out of moves and run out of time in this tournament. What’s next for Wesley So? Karjakin-Andreikin, Wojtaszek-Giri were comfortably drawn games as was Eljanov-Jakovenko. Topalov-Svidler was combative, but perhaps the Bulgarian lost his fighting spirit or motivation. In the final position he was actually dead lost, but Svidler offered a draw to advance. 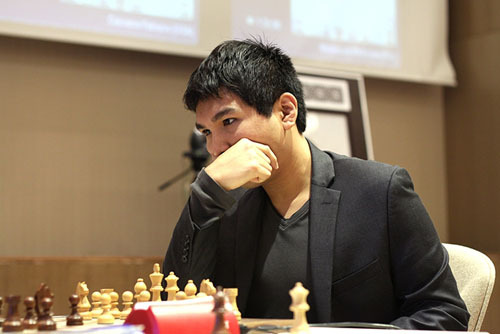 Adams-Nakamura went down to minimal material out of a Berlin Defense. Unfortunately, there were no imbalances in the positions for Adams to strive for an advantage and neither side was in any danger. Of course, that meant that Adams’ run would end. We will not soon forget his thrilling battle will Leinier Dominguez in the previous round! Nakamura is happy to advance and will be the lone American. Hikaru wanted to say something about the controversy, but Miro kept focusing on the games. We never heard his statement. Perhaps it was best? Oh thanks Daaim didnt know, does anyone know why theses traditioanlist seem attracted to my ULTRAMODERN WORD “TRICKIE”? LOL. The crowd is thinning out. Now only eight remain. In today’s four tiebreaks, there is a lot at stake with the $10,000 extra for advancing and two seats in the Candidate’s tournament in March. Nakamura has already qualified and Anish Giri will qualify by rating. For players like Peter Svidler, this would be the only chance and the Russian is looking to repeat his 2011 World Cup win. In today’s tiebreaks, the Ding-Wei match would be the attraction. There were a lot of superlatives used to describe the talent of the two Chinese and their style of play. After Giri won both of his tiebreak games against Radaslow Wojtaszek, he mentioned that he had analyzed games from the Chinese league and found the games fascinating. That would be the consensus of the classical games. The two rapid games were drawn but the second The first blitz game had a bizarre computer-like opening. After 10. Qf4 Nh5 11. Bxf7+ Kh8 12. Qg3!? Rxf7 (12…Nxg3 13.Ng6+ hxg6 14.hxg3 mates.) 13. Nxf7+ Qxf7 14. Qd6. This game continued its weird play and none the commentators knew what was going on. In addition, time pressure was afoot and both players were scrambling. 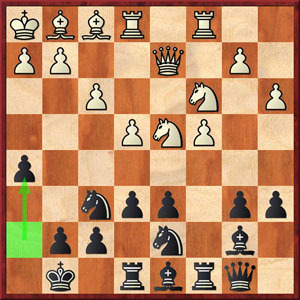 After some very sharp tactical play, Ding played 28…Nc4 29. bxc4 Qxc3 30. Qxf4 Qb4+ 31. Ka1 Qc3+ Draw. In the second blitz, Ding Liren repeated the English Opening he tried in the second rapid. He was able to work up an advantage, but ended up frittering away the advantage and losing the match. 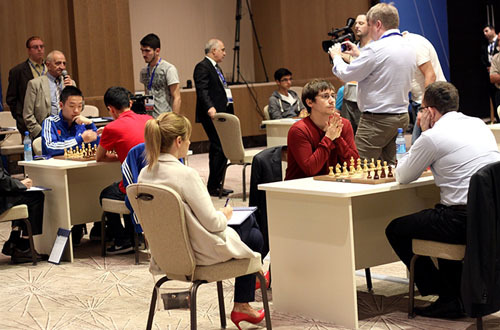 In Jakovenko-Eljanov, the Ukranian won the match on the strength of a nice, clinical victory in the second game. Sergey Karjakin won his match on the strength of his well-played first game. That leaves two Russians in the final eight. There was talk about Russians being dominant after placing eight players in the last 32, but of course knockouts are far different. The results show the parity and there is clearly no dominant power in world chess today. Really enjoying these articles due to a near-total inability to follow the games during the day. Very well done!